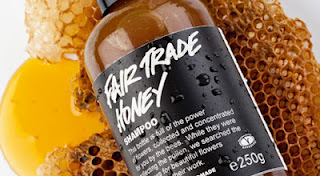 Lush has recently introduced a selection of new products to its existing haircare lineup, including Fair Trade Honey Shampoo which I was sent for review. The press release explained that Fair Trade Honey Shampoo is "full of the power of flowers" with a base of more than 50% fair trade honey and 20% linseed mucilage to moisturise and add shine & lustre to locks. The high honey content means that Lush are able to do away with preservatives (the high sugar content is a natural preservative, preventing bacteria from growing), which I was pleased to see as one of my bugbears with Lush is that their products are far from natural, despite their ethical ethos (this shampoo is also vegetarian). It is particularly recommended as a softening shampoo for those who live in hard water areas. At £7 for 100g, I thought that this was expensive (it costs more on a price per ml basis than my salon brand shampoo) and whilst this probably relates in some part to the high quality ingredients, I can't help but wonder how their customers will respond to such a high price point. Fair Trade Honey Shampoo has a very dark colour which reminded me of honey and really appealed to me. Luckily, the scent put me off eating it! Although down to personal taste, I absolutely hated the scent (it's a floral blend of geranium, rose, bergamot and neroli). It had a very strong scent which would put me off repurchasing, although I was pleased to note that it didn't linger once I'd dried and styled my hair. The first time I used this, it made my hair very tangled which is something I've never experienced with shampoo before. This did improve with subsequent uses although my hair was still left tangled. In spite of this, I did feel that it was beneficial to my hair. Fair Trade Honey Shampoo is suitable for all hair types but is particularly recommended for dry hair and I have to admit that it left my recently dyed hair feeling super moisturised. However, I'm not sure I will repurchase this once the bottle runs out as I really didn't like the scent. I love lush and didn't realise that they weren't natural! I was always under the impression that the ingredients they used are of good quality! Sounds great, I'm on the prowl to try this asap!